Bethesda West Medical Office Building is one of the first buildings of its kind in Palm Beach County: Only one other significant medical office property has come out of the ground since 2008. The Bethesda property complements the 80-bed Bethesda Hospital West at the northeast corner of Boynton Beach Blvd. and Highway 441. Since breaking ground in October, the 67,000-square-foot medical office building has attracted positive attention among local physicians. The location is attractive in that it serves the growing communities in the surrounding area and enables physicians to make rounds at Bethesda West and other hospitals in less time. 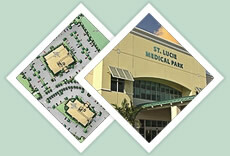 Slated for a May 2013 opening, the three-story property is easily accessible from Highway 441 and Florida’s Turnpike. The Greenfield Group is inviting physician tenants to participate in ownership of the building by way of the company’s historically successful Physician Partnering Program. The ownership creates a source of revenue for physicians. It significantly lowers the cost of renting compared with straight rental properties. In addition, the form of ownership is not a condominium, so physicians are not saddled with landlord duties or sale challenges when the physician is finished with a space.